Proto Labs is the world’s fastest source for custom CNC machined parts and injection molded parts. Using their “Firstcut” and “Protomold” services, customers can get real materials, real functionality, and real value in as fast as one business day. Speed — Get CNC machined parts at least as fast as you can get additive rapid prototypes. Convenience — Firstcut brings the online quoting and ordering you expect from rapid prototyping to the CNC machining world. Real material properties — Parts are machined from real blocks of plastic and aluminum — not the “material like” materials used in additive rapid prototyping processes. Improved surface finishes — CNC machining eliminates the stair stepping inherent in the additive processes. 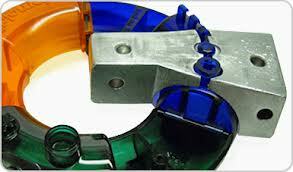 Injection molding is best for quantities up to 10,000 pieces, with prices starting at $1,495. Small quantities can be shipped same day, and complete high-volume orders filled in about two weeks. Developers and manufacturers typically use the Rapid Injection instead of Rapid Prototyping or 3D Printing for lower unit cost and higher order numbers. At the other extreme, Conventional Injection Molding is used for very large and full production manufacturing in excess of 10,000 units. The automated the process of designing and manufacturing molds based on customer supplied 3D CAD part models. Due to this automation, we typically cut the lead time for the initial parts to one-third of conventional methods. Cost saving varies with the number of parts being produced, but Rapid Injection Molding may also have a substantial cost advantage in runs of up to thousands of parts. What do you give up? Actually, very little. Protomold produces quality molds using advanced aluminum alloys and precise, high-speed CNC machining. Parts can be molded in almost any engineering grade resin. The Protomold Rapid Injection Molding process gives design engineers a fast and affordable way to get real injection molded parts in prototype or low-volume quantities. We work with advanced aluminum alloys and high-speed CNC machining. Our process features an unprecedented degree of standardization and automation, which is how we deliver injection molded parts faster, and more economically than anyone else in the world. This allows Proto Labs to support prototyping, bridge tooling or low-volume production requirements of our customers as noted below. Prototyping – Rapid prototyping processes are ok for testing form and fit, but FDM, SLA and the others are no substitute for testing with real injection molded parts. With Protomold, you can get prototype injection molded parts for as little as $1495 and shipped as fast as the next business day (for a premium). Just what you need for function testing before going to production. Bridge Tooling – When your production tooling won’t be ready for another three or four months, it’s great to have a way to make those 100, 1000 or 10,000 parts for pilot production or market testing. With Protomold, your bridge tooling is ready to go with no additional cost or delay. Production – If your volume requirements don’t justify expensive steel production tooling, Protomold can supply production parts to meet your full requirements. Multi-cavity aluminum molds can be very cost effective, and Protomold will ensure the tools last for the life of your project.